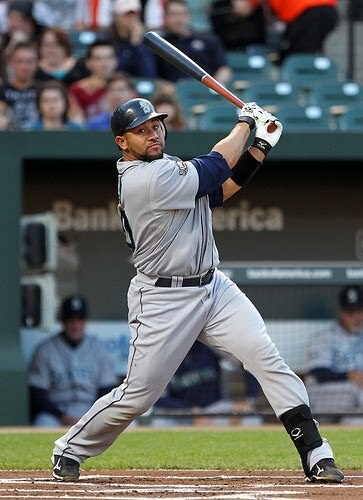 Miguel Olivo was by far the hero in today's game with two homeruns to lead the Mariners to a 7 - 3 victory over the Detroit Tigers. The Mariners started slow, getting just one hit through the first 4 innings, but it was the 5th inning that things turned around. Behind 2 - 0, Miguel Olivo led off the 5th inning with a solo homerun to left field to make it 2 - 1. Guti flew out to right and was followed by Figgins who walked and stole second. After a ground out by Jack Wilson, Ichiro dropped a pop fly right between three fielders in shallow right to score Chone and tie the game at 2. Brendan Ryan singled and then Smoak singled to score Ichiro as the M's took the lead for good. In the top of the 8th with one out, Carlos Peguero walked to bring up Miguel Olivo again. To add a little insurance for his starting battery-mate, he hit a 2 run shot over the left field fence for his second HR of the game. Mariners up 5 - 2. Felix came in again to pitch the eighth and surrendered a run on a single by Alex Avila scoring Cabrera but finished the inning with a 5 - 3 lead after throwing 126 pitches. Justin Smoak added some fun to the party when he hit a two run homer of his own to left field scoring Ichiro in the top of the ninth. Mariners 7 - Tigers 3. That would prove to be the end result as Brandon League came in and closed the door in the ninth in a non-save situation. A little bit of spark in the lineup today and Ichiro has 4 hits in the past two days since his day of rest. GREAT NEWS!!! The Texas Rangers got beat up by Minnesota again as Francisco Liriano almost got another no-hitter. Texas losing brings the Mariners within a game and a half of first place. June 12th, a game and a half back, who would have guessed? Tomorrow we are back home facing the struggling Angels and Dan Haren as the M's put Jason Vargas on the hill.